Because you are seriously missing out if you're not! Gilmore Girls, which first premiered in the year 2000 (whoa! 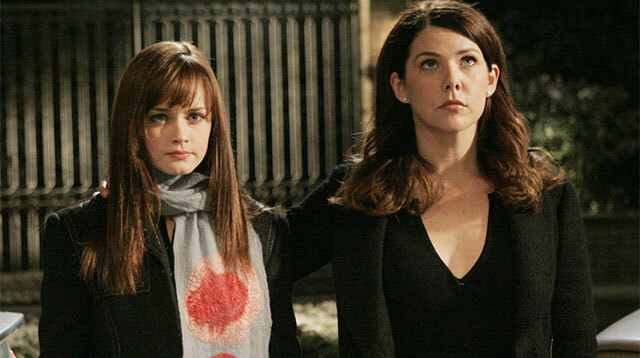 ), is a story about mother-daughter tandem Lorelai and Rory Gilmore (Lauren Graham and Alexis Bledel). Set in the small town called Stars Hollow, it’s a funny and oft-emotional look at two vulnerable, complex, and lovable women as they try to navigate their relationships and lives. If you’ve recently run out of television shows to binge watch, it might be best to apply a little #tbt to your viewing experience by immersing yourself in this oldie (but goodie!) series. It’s the perf comedy-drama that will keep you glued to the couch for an ace marathon sesh. Here are more reasons why you should get on it, stat! 1. The themes are so on point. In its original seven-season run, the show dealt with issues of family, love, and friendship. It’s guaranteed to bring lots of laughs and stoke all your #feels. 2. It had the best writing. EVER. The unique thing about Gilmore Girls was its blatant use of numerous pop culture references interspersed into the script. The dialogue was fast-paced and quick-witted, a signature quality of the show that fans came to adore. The wordplay used by the numerous characters even inspired a thing called Gilmorisms, a glossary of in-show terms and expressions. 3. Lorelai and Rory are mother-daughter #goals. Okay, they might not be the most perfect people out there. But as a single mom, Lorelai was cool AF! And Rory, well, she was just always gorgeous (Alexis Bledel’s eyes are TDF! ), and had the best comebacks for her mom. Their relationship—their closeness and sometimes brash honesty—was, back then at least, a new model for what the modern family could be and look like. 4. You can choose your favorite love interest! With seven seasons under its belt, the leading ladies have had their fair share of romantic relationships with men who induce kilig moments and the occasional heartbreak. Rory’s had Dean, Logan, and Jess (Jared Padalecki, Matt Czuchry, and Milo Ventigmilia), while mom Lorelai had Max, Luke, and Christopher (Scott Cohen, Scott Patterson, and David Sutcliffe). Pick a team, ship it, and hope it all works out for the best! 5. Netflix is premiering a miniseries! YAS! Season eight, with four 90-minute episodes, is set to premiere on November 25 on Netflix. Titled Gilmore Girls: A Year in the Life, the trailer shows that both Lorelai and Rory are still at it, funnier and sassier than ever even. So if you have yet to see the last seven seasons, you still have time, CG!